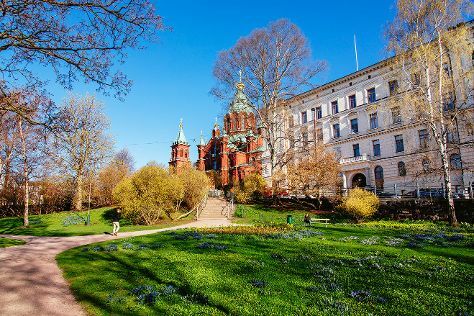 Start off your visit on the 21st (Thu): take a stroll through Katajanokka, brush up on your military savvy at Sea Fortress Suomenlinna, wander the streets of Ullanlinna, then contemplate in the serene atmosphere at Rock Church, and finally take in the spiritual surroundings of Kamppi Chapel of Silence. On the 22nd (Fri), you'll have a packed day of sightseeing: soothe aching muscles at some of the top local wellness centers, then take in the architecture and atmosphere at Helsinki Cathedral, then take in the spiritual surroundings of Uspenskin Cathedral (Uspenskin Katedraali), and finally indulge your thirst for a good beer at Stadin Panimo. For other places to visit and other tourist information, refer to the Helsinki trip builder app . Singapore, Singapore to Helsinki is an approximately 15.5-hour flight. You can also do a combination of flight and ferry; or do a combination of flight and train. The time zone difference moving from Singapore Time to Eastern European Time is minus 6 hours. Expect much colder temperatures when traveling from Singapore in March; daily highs in Helsinki reach 3°C and lows reach -5°C. Wrap up your sightseeing on the 22nd (Fri) early enough to travel back home.